When installing Windows Vista on VMWare Server or VMWare ESX Server using ISO image of Vista setup DVD, after boot up normally with Windows Vista installation DVD ISO image, the setup will then halted for error message in a pop-up window titled “Load Driver” that basically implies that the the driver for the virtual CD/DVD-ROM that just been used to boot up the computer is not found. A required CD/DVD device driver is missing. 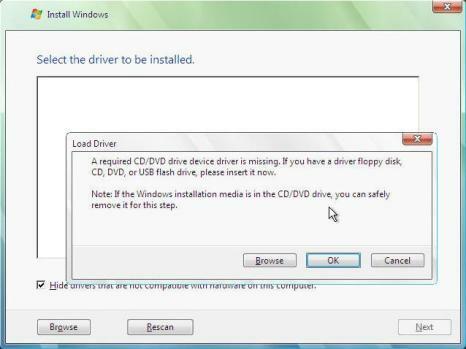 If you have a driver floppy disk, CD, DVD or USB flash drive, please insert it now. The error is pretty weird as Windows Vista obviously recognizes that simulated DVD-ROM drive in Windows Vista VM while booting up, and successfully started the installation process. But soon it fails to find the DVD-ROM in Windows Vista VM drive again. The possible cause likely to be some VMWare virtualization product such as VMWare and VMWare ESX Server use different kind or type of CD-ROM emulation, which Windows Vista does not have the driver of it, thus preventing the Vista installation to proceed. The resolution is to provide the device driver for the CDROM drive to Vista. VMWare Communities have provided a .FLP virtual floppy image file that can be mounted to the Windows Vista virtual machine to provide the needed driver for the setup to continue. Download the GrayconDrivers.flp (no longer available) virtual floppy image file. Load the virtual floppy image in Windows Vista VM. Before that, ensure that you have connected the floppy drive for the virtual machine by selecting the “Connect at power on” option for virtual floppy configuration, and the device status is connected. Else after resetting the VM, the floppy drive may be disconnected. To mount the floppy, click on the “Settings: on the VM window’s menu bar or toolbar. In the Virtual Machine Settings, select the “Floppy Drive”. Under the Connection section, click on “Use a floppy image”, and then enter the path to the FLP file you have downloaded just now. You can also click on “Browse” to locate the file in folder. Click OK when done. Now go back to Windows Vista installation screen in the VM as shown above, where the error occurs. Click on Browse to locate the driver for the CD-ROM and DVD-ROM on the A: drive and click OK. Wait for the driver installation to complete, and the installation process should be able to continue as usual.